As you may know we are on a journey to find the “Gold Standard” of my favorite Mexican dish; Chileverde. We have traveled near and far to find the best dish of cubed pork bathed in gravy of green chile and spices. What a pleasant surprise when we found Judy’s place located in Crockett California. Crockett is our adjoining town situated on the scenic Carquinez Straits. You might even say Judy’s is “Right under Our Nose”. Downtown Crockett is all of three blocks long. Judy’s is located at the end of downtown across from the High School. It is a tiny little establishment that at one time was a Foster Freeze. It is family run and owned. We were greeted by Judy and her husband like we were old friends. Inside there is a counter with a menu board. 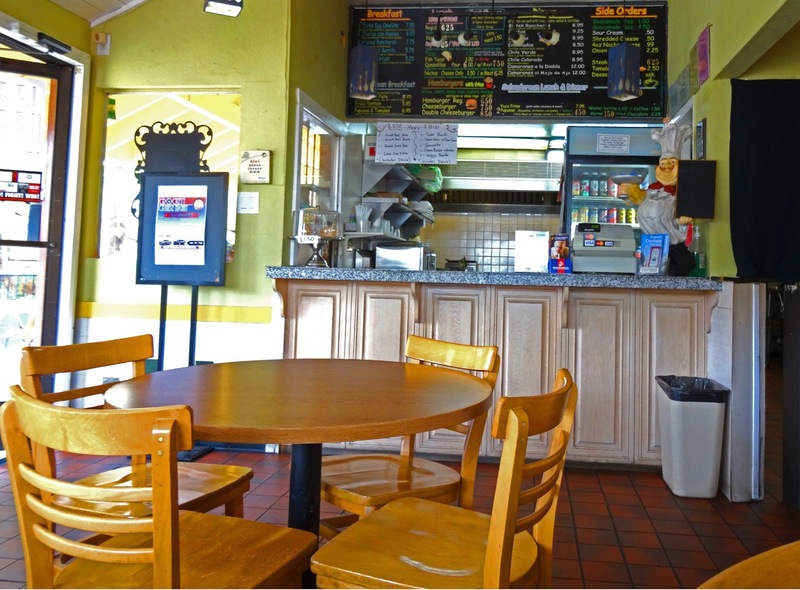 You place your order and choose one of three tables inside or a couple that are outside. 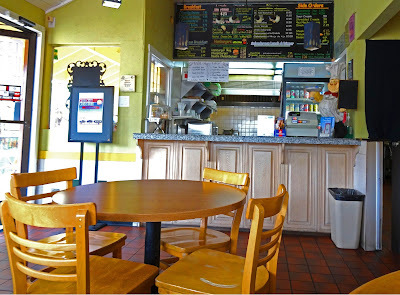 The menu is predominately Mexican food but also has El Salvador and Guatemalan influences. We ordered our standard items of Chileverde and Ms. Goofy a pork burrito. I took high school Spanish and am frequently exposed to the language. I can understand basic sentences but do not even try to speak the language. I mention this because Judy spoke Spanish to her helper explaining the ingredients that went into Chileverede. She instructed her cook to take jalapenos, onions and cilantro and put them in the blender. I was a little concerned at this point. Not to worry I was pleasantly surprised. The plate of Chileverde looked pretty as a picture. 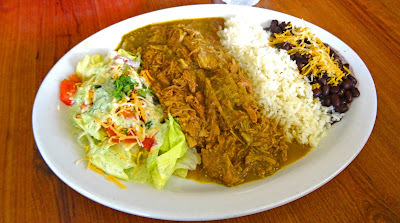 It was served with black beans and white rice a Central American influence. The pork was shredded and tender. It was seasoned nicely. The freshly made chileverde sauce was flavorful with a playful kick from the jalapenos.. Ms. Goofy really loved her burrito. It was huge with the same meat filling that I was served. We plan to return to explore more of Judy’s menu items. Papusa’s, different mole dishes and for the high school kids; burgers are part of this Latin fusion menu. Did I mention the prices? 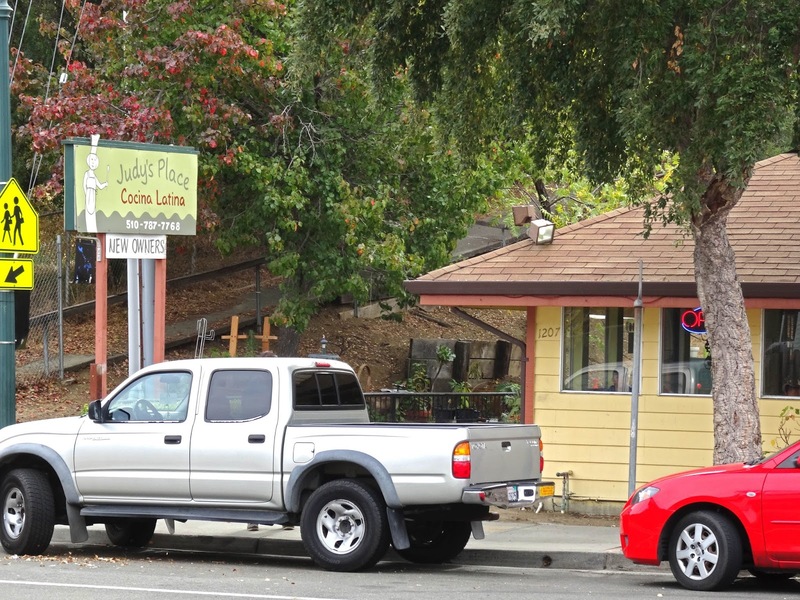 Judy’s place is more than reasonable that delivers home-style Latin dishes that are prepared to order. Was this the “Gold Standard” for Chileverde? No but Judy’s Place is a local gem that we definitely will return to soon. Big Dude, I just placed Oscar's Cafe on the bucket list. I sure do like chile verde.